BANAUE, Ifugao – The traditional Unity Gong Relay, which is one of the major activities for the annual celebration of the founding anniversary of the Cordillera Administrative Region (CAR), will kicked off in this premir tourist destination to jumpstart the various activities lined up for the celebration of the region’s 31st anniversary on July 15, 2018. The theme of this year’s celebration is “CAR@31: Regional Atuonomy for Good Governance” which is congruent to the region’s renewed quest for regional autonomy and in support of the Regional Development Council’s thrust of autonomy towards federalism. The kick off program started at 9 am bgefore the Unity Gong will be travelled to Sagada, Mountain province where a welcome program will be conducted in the municipal grounds. On July 10, 2018, the Unity Gong, together with the convoy of participating agency and local government representatives, traveled from Sagada, Mountain Province to Kalinga where the Kalinga delegation will meet the convoy in Tinglayan before the welcome program in Tabuk City, Kalinga. 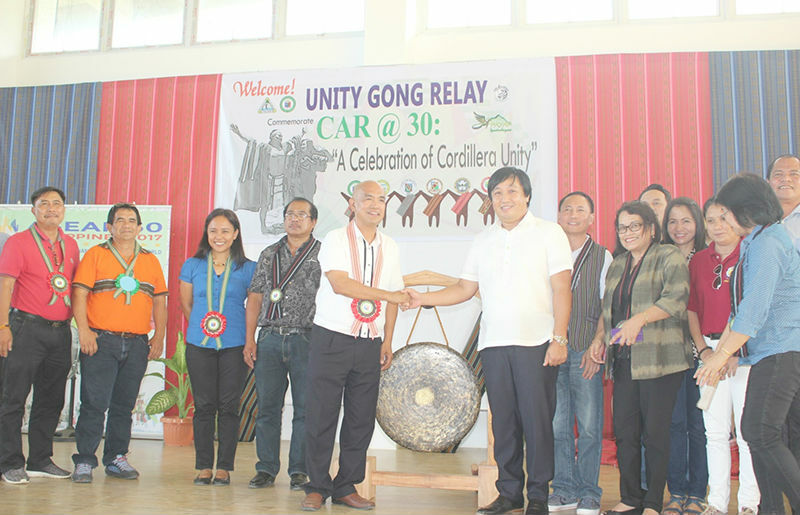 The Unity Gong will gain travel to Conner, Apayao which will be followed by a welcome program and friendship games in Kabugao town on July 11, 2018. On July 12, 2018, the Unity Gong will travel from Luna, Apayao to Bangued, Abra where the convoy will be met by Abra delegation at the boundary of Abra and Ilocos Sur before the conduct of the welcome program at the Abra provincial Capital. The Unity Gong will then travel from Bangued, Abra to Baguio City wherein the welcome program will be conducted at the Baguio City hall grounds before it will be travelled to the Benguet Provincial Capitol in La Trinidad wherein a similar program will be sponsored by the Benguet provincial government. On July 14, 2018, the Unity Gong will travel back from Benguet to Ifugao wherein it will be received by the members of the Ifugao delegation in Lamut town wherein it will be capped by a tree growing activity in the vicinity of the Panudpudan District Hospital. After the culimination of the Gong Relay, the organizers were able to line up the conduct of a fashion show, autonomy concernt and fellowship night for the various delegations before the main program of the 31st founding anniversary of the CAR which will be held at the Don Bosco gymnasium in Lagawe town on July 15, 2018. Gov. Pedro Mayam-o extended the invitation to all concerned stakeholders in the different parts of the region to actively participate in welcoming the Unity gong in their provinces to show the overwhelming support of the Cordilleans in the region’s renewed quest for autonomy which is also in line with the present administration’s bid to shift from the unitary system to federal form of government where there will be the decentralization of powers and resources to ensure equitable chances for robust development. 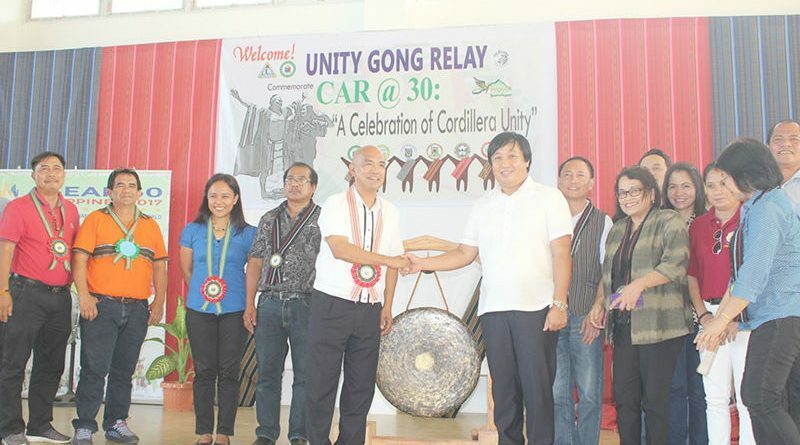 The gong is used as a symbol of unity among Cordillerans because it is usually played and beaten during special occasions and gatherings to signal unity and camaraderie among the people for a certain cause. And to celebrate for bountiful gains from the gift of God for the fruits of nature.